The ways that scholars and students used libraries during the nineteenth century were quite different from modern practices. Theophilus A. Wylie was the librarian for the university from roughly 1840 until 1870. He also maintained a personal library of around 700 books that are currently housed in the Wylie House Museum. Wylie saw a clear difference between how he purchased materials for the University Library and how he used his own personal library. The University Library, in Wylie's view, was meant to serve the needs of the educational curriculum whereas his personal library was a tool both for scholarship and for mentoring students interested in research. This catalogue of the Indiana University Library in 1842 was published while T.A. Wylie was the University Librarian. A list of books purchased by T.A. Wylie for the Indiana University Library. In this report written in 1865, T.A. Wylie spent much more time discussing how the books are used in the curriculum rather than how they are used for research or other uses. T.A. Wylie discussed the importance of libraries as a method for finding information, not as a way of "digesting" knowledge in this lecture. According to Wylie, libraries are like a dictionary, where one goes to quickly look up information. In Wylie's view, institutional libraries like that of Indiana University were meant to be used for classes, not for his own personal research. During his tenure, Wylie also appears to have added significant numbers of books about science, perhaps demonstrating his own interest in integrating science into the curriculum. These four items contain a sampling of Wylie's thoughts about the University Library during the time he served as Indiana University's librarian. The first two items represent Wylie's administrative duties. In the Catalogue of 1842, Wylie helped to write a list of all of the books contained in the library at the time. Unfortunately, the library burned down shortly after the catalog was completed. The second item is a list of books that Wylie either purchased or received as donations presumably sometime after the burning of the original university library. In this list, there is a much higher percentage of books on science than there seems to have been in the original 1842 catalog. The other two items are a report and a speech Wylie gave concerning the library. In both of these documents, Wylie seems to have emphasized the importance of the library in aiding the curriculum. In his library committee report, Wylie discussed the curriculum much more than the budget of the library. In his speech on Books and Libraries, Wylie also stressed the need of a good library to advance the learning of students. This spreadsheet lists all of the books in Theophilus Wylie's personal library still existing in the Wylie House Museum. In addition to author and title, the dataset categorizes books and visualizes subject categories within the library. Also included in the dataset are some comparisons between T.A. Wylie's personal library, the Indiana University Library, and some purchases Wylie made for the university library. Theophilus A. Wylie created this examination, found in Wylie's copy of Neil Arnott's Elements of Physics and Natural Philosophy (1829). The page numbers on the left refer to page numbers in the book. Wylie heavily annotated his personal copy of this book by Benjamin Silliman. The annotations found in this book were possibly related to the article Wylie wrote for the Proceedings of the American Philosophical Society and to the article Wylie wrote with Daniel Kirkwood in the Monthly Notices of the Royal Astronomical Society. The book also contains Wylie's handwritten notes about an experiment he performed on gold discovered in Indiana. Wylie later wrote a letter to his friend John Fries Frazer about this experiment, and Frazer reported Wylie's results in the Proceeedings of the American Philosopical Society. 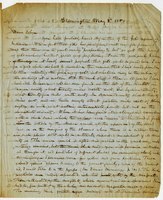 This is report based on a letter Wylie wrote to John Fries Frazer and published in the Proceedings of the American Philosophical Society. It may also be related to the annotations Wylie wrote about his experiments in Benjamin Silliman's Principles of Chemistry. This page from Wylie's personal copy of the American Journal of Science mentioned in an annotation from Silliman's Principles of Chemistry. Theophilus Wylie assisted with observations for this article published by Daniel Kirkwood in the Monthly Notices of the Royal Astronomical Society in 1867. Wylie's notes on meteors contained both within Silliman's Principles of Chemistry as well as in Wylie's copy of the American Journal of Science may be related to the research Wylie performed with Kirkwood. Wylie wrote this letter to John Fries Frazer at the University of Pennsylvania, where he reported on the experiment Theophilus Wylie wrote about in the margins of one of the books in his library. John Fries Frazer presented this report, it is the result of the experiment Wylie wrote about in one of the margins of Silliman's Principles of Chemistry. Wylie's personal library was used for his own research, which he often conducted with his colleagues and students. Additionally, Wylie's personal library shows a clear understanding of scientific trends and ideas developing over the course of the nineteenth century, particularly in Britain. Wylie was reading some of the most well-known thinkers of physics and scientific education, indicating that professors like Wylie helped connect Indiana University to some of the most important scientific thinking at the time. Wylie used his personal library for a variety of puposes, and these items help to showcase just a few of them. The first item is a spreadsheet that lists all of the books contained in Wylie's personal library and some general details about the University library. By comparing Wylie's library to the purchases Wylie was making for the University Library, one can see that Wylie put into practice many of the ideas he proposed in his speeches about the University library. It also provides an overview of the subjects and materials with which Wylie engaged. This spreadsheet shows that Wylie was very interested in some of the most important scientific thinkers in the mid-nineteenth century. The books and book pages presented here represent Wylie's annotations on these books show some of the ways that he was engaging with these thinkers. Not surprisingly, Wylie also used his library to help with teaching. The second item is an exam written by Wylie; it was possibly a study guide or as an exam Wylie would have used with his students. This item was found in Wylie's personal copy of a textbook on natural philosophy. Wylie also used the library for his personal research. For two of the articles that Wylie wrote in the Proceedings of the American Philosophical Society and the Monthly Notices of the Royal Astronomical Society, Wylie used books from this library, in particular his copies of the American Journal of Science (the principle scientific journal in the U.S. during much of the nineteenth century), and Benjamin Silliman Jr.'s Principles of Chemistry in which Wylie records his experiments on gold ore.